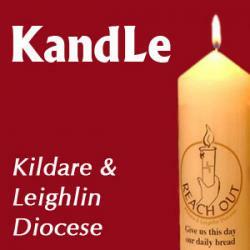 Kildare & Leighlin Diocese has 56 parishes and a Catholic population of nearly 250,000. You can find out more about our diocese and our services on our diocesan website – KandLe.ie – along with accessing our pastoral resources. In the final part of this four part series exploring the Mass, Julie Kavanagh and Fr David Vard reflect on the Concluding Rites of the Mass. In the third part of this four part series exploring the Mass, Julie Kavanagh and Fr David Vard reflect on the Liturgy of the Eucharist. In the second part of this four part series exploring the Mass, Julie Kavanagh and Fr David Vard reflect on the Liturgy of the Word. Bishop Denis Nulty invites people to follow this Lenten catechetical programme on the Sunday Mass, the source and summit of the Christian life. A step by step demonstration of how to make a St Brigid's Cross. Recorded in Kildare Town at Feile Bride 2013. In this book, Fr Sean Hyland (K&L Diocese) shares how he found consolation after the deaths of his two young children, Seana and Kieran, and his wife Liz. Special WMOF TV report on the Family Fun Day hosted by the Diocese of Kildare & Leighlin as part of the preparation for WMOF2018. Bishop Denis Nulty, Fr David Vard, Nicola Byrne, Ellen Phiri and Noeleen Lynam welcome the official announcement of the visit of Pope Francis to the World Meeting of Families 2018 to be held in Dublin in August. Colm Hogan, Julie Kavanagh and Siobhan Tighe discuss their recent visit to Matome, Sierra Leone where families are recovering from a devastating mudslide. All roads lead to Punchestown on Sunday, August 27th 2017 for the Family Picnic Day that is being hosted by the Diocese of Kildare & Leighlin. Highlights from the ordination of David Vard (K&L) in Newbridge on 25 June 2017 to accompaniment of the 'The Deer's Cry'. The homily by Bishop Denis Nulty (Diocese of Kildare & Leighlin) at the ordination of David Vard in Newbridge on 25th June 2017. Julie Kavanagh introduces this four part series with a brief overview of some key aspects of the liturgies of the Triduum. Bishop Denis Nulty encourages people to get behind the World Meeting of Families 2018 including by supporting the National Collection on 1 / 2 April 2017. Bishop Denis Nulty marks the beginning of the 2017 Confirmation in K&L and answers questions from some of the candidates. Bishop Denis Nulty shares how Pope Francis was a model of a listening leader at his 2 hour meeting with all the Irish Bishops during their recent Ad Limina visit. Bishop Denis Nulty (Kildare & Leighlin Diocese) gives us a first-hand account of his recent visit to various Trocaire projects in Zimbabwe. Bishop Denis Nulty answers questions from the 2016 Confirmation candidates from primary schools in the Diocese of Kildare & Leighlin. Homily by Bishop Denis Nulty at the funeral for Fr PJ Byrne RIP, Parish Priest of Kilcock which took place on 12th Feb 2016. Homily by Fr Willie O'Byrne at the removal service for Fr PJ Byrne RIP, Parish Priest of Kilcock which took place on 11th Feb 2016.